"Dolores Huerta: Revolution in the Fields/Revolucón en los Campos"
Debuting at the California Museum, "Dolores Huerta: Revolution in the Fields / Revolución en Los Campos" is a new traveling exhibition from the Smithsonian Institution exploring the life and legacy of the legendary Latina activist who broke barriers for more than six decades, starting with her work advocating for farm workers' rights in the 1960s and 1970s. Inspired by the Smithsonian's National Portrait Gallery's exhibition "One Life: Dolores Huerta," the bilingual touring exhibition includes reproductions of historic photographs, a smart phone audio tour app and a documentary video. 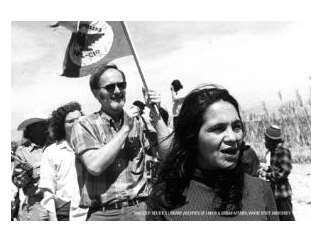 As part of the inaugural installation, the California Museum's presentation features hands-on civic engagement activities and supplemental artifacts on loan from Huerta's personal collection and other institutions further illustrating her ground-breaking but often overlooked achievements and the history of California's farm worker movement. On view Mar. 9 through July 7, 2019 - only at the California Museum in downtown Sacramento. Open Tues. - Sat. 10:00 a.m.-5:00 p.m. and Sun. 12:00-5:00 p.m. Admission: $7-9. For more information, visit http://bit.ly/dolores-huerta.